The discovery of oil at the beginning of the Depression, at a time when there was little disposable income for Venice's amusement industry, brought the possibilities of untold wealth for the community. The Ohio Oil Company brought in a wildcat well on December 18, 1929 on county property just east of the Grand Canal at Avenue 35 (now Eastwind on the Marina Peninsula), only two blocks from the ocean. The well initially produced 3000 barrels a day of deep sand oil from a depth of 6199 feet. The company then asked for a zoning variance that would permit them to drill for oil within the city limits on the Venice Peninsula. The town's excitement soon turned to oil fever. Parcels of land and mineral rights rapidly traded hands. Residents talked of nothing but oil and the money that could be made by having an oil well in one's backyard. On January 9, 1930 a crowd of 2000 met with city officials at the old City Hall and demanded re-zoning to allow oil drilling. Nearly 95% of the residents were in favor of the change. Ocean Park residents weren't so lucky since Santa Monica was against drilling. Los Angeles city planners lifted the ban on January 28th, but were cautious and only allowed drilling south of Leona (Washington Street). They set up rules allowing a maximum of two wells per city block, then issued 15 permits. Two weeks later the city rubber stamped the permits. The Ohio Oil Company began drilling their second well in March and struck oil on May 3rd. It was a small well that only produced 1500 barrels per day. Owners of Star #1 were luckier a month later when their well at Avenue 35 and the Grand Canal came in at 5000 barrels per day. By June the payroll in the oil field was $75,000 per week. By late September, when nearly 50 wells were in operation, the oil field was ranked 6th in the state. The fashionable and promising residential district, however, had turned into a noisy, smelly, ugly and dangerous area. Oil waste was constantly being dumped into the canal and lagoon, and an explosion only a month before destroyed one oil rig. The city closed the Florence Nightingale School on the peninsula for safety and transferred the children to other schools. Though they sought restrictions to protect the beach and tidelands from drilling, it was too late. The beach was already polluted. The oil field was so successful that by the end of the year, oil company owners planned to curtail production to stabilize prices. A local gas price war had lowered prices to eight cents per gallon and profits were down. The 148 operating wells were producing at a rate of 46,932 barrels and 2,000,000 cu ft of gas daily. 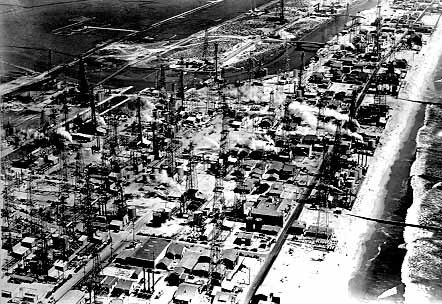 As the Venice oil field grew to 340 oil wells, in 1931 it became the 4th most productive oil field in the state. 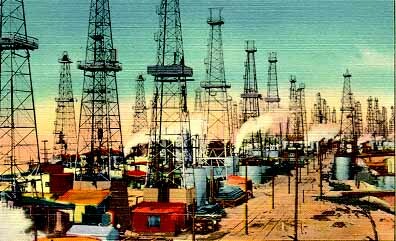 Unfortunately the oil field was soon depleted by early 1932 and oil production dropped way down. By the end of 1942 they had pumped a total of 47,488,128 barrels, but by then production was only 688 barrels per day. The unsightly oil derricks on the Venice Peninsula were slowly removed as people began to settle the promising beach area again. In 1959 only 64 derricks remained and the last one was removed in 1962. There was still oil in the ground, and these remaining oil wells, mostly owned by Graner Oil Company of Signal Hill, still pumped like bobbing grasshoppers a few dozen barrels a week each. As property values rose in the 70's, the land was sold or developed and the last of the oil wells were capped. 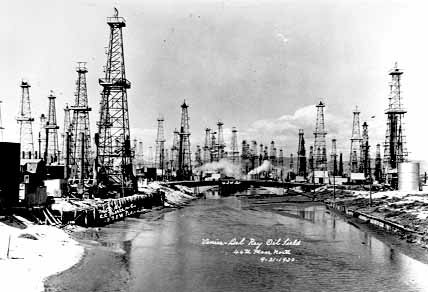 The Los Angeles city government, always in need of revenue, asked the oil companies in 1958 to bid on oil drilling leases under the Venice tidelands. They felt that it was possible to slant drill without polluting the Santa Monica Bay. By 1962 city planners approved slant drilling in the North Beach area. Residents would get $50 / month if oil were found. The County Supervisors in 1963 backed an oil drilling project in the bay since they would get $25-50 million from the leases. Oil companies planned to build two offshore oil drilling islands. However the State Lands Commission in September 1964 unanimously denied the Los Angeles' application to lease offshore lands for oil production. That same year Standard Oil, who drilled a well and struck oil at Pacific and North Venice Blvd. (had a previous failure at Rose and 7th), wanted to launch a 600 acre oil drilling district. The zone would extend from Pacific to Washington Street to Crestmore Avenue to Lincoln, down Palms to San Juan to Electric to Washington. They claimed that they had a contract with 75% of the residents. While the city's planning department granted conditional approval for six oil drilling districts totaling 1800 acres, the Venice Property Owner's Association began to fight the proposal. The only oil contracts that were signed were between the city's Parks and Recreation Department and Socony-Mobil for a beach site where the Venice amusement pier once stood. The oil company bid $1,650,000 for the rights for the off-shore oil that they slant drilled to reach. The city also received 1/6th of the gross and 50% of the net profits from the field. They struck oil in March 1966 and by June were pumping 2000 barrels per day from three wells. The unsightly oil derrick was camouflaged as a lighthouse and the area adjacent to the Venice Pavilion was landscaped. While much of the oil revenue was earmarked for the Venice area, the Venice Planning Commission was angry that it was not available for canal renovation. Instead it was diverted for a fishing pier project in San Pedro. The beach oil field was finally depleted in the early 1990's. While the oil company put up a deposit of $500,000 to restore the site for beach use, the city claims it would cost nearly $2,000,000 to clean up the site and remove pollutants. Since the money isn't available, the concrete walled area remains a Venice Beach eyesore.